I’ve been reading about lobster rolls and lobster roll rollouts for several weeks. No way will I chop and sauce up lobster for a sandwich. It’s lobster and drawn butter when lobster happens around here. But shrimp? That’s another matter. I made a dressing for the shrimp with a little kick of horseradish. On the side, I my my creamy, sweet and vinegary cole slaw. 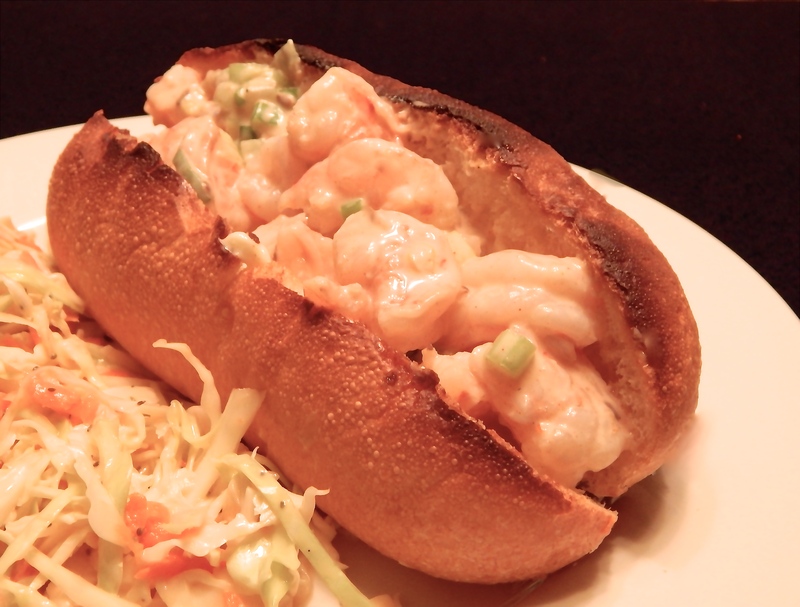 Savory shrimp roll with sweet/tart cole slaw makes a tasty summer supper. Boil shrimp in salted water until cooked through – about two minutes. Drain, rinse in cold water until cool. Pat dry and chop into bite-sized pieces. Whisk together celery, scallions, mayonnaise, dill, lemon juice, horseradish, vinegar and paprika. Season with salt and pepper. Fold in shrimp. Meanwhile, heat broiler. Toast buns on rimmed baking sheet until golden. spread butter on each bun and fill with shrimp salad. Yesterday, I picked up some fresh roasted chile. We’re lucky enough to have a grocery chain that roasts green chiles every day year ’round. This morning, I woke up and it was very cloudy, a little rainy and it appeared to be cooler than it actually was. 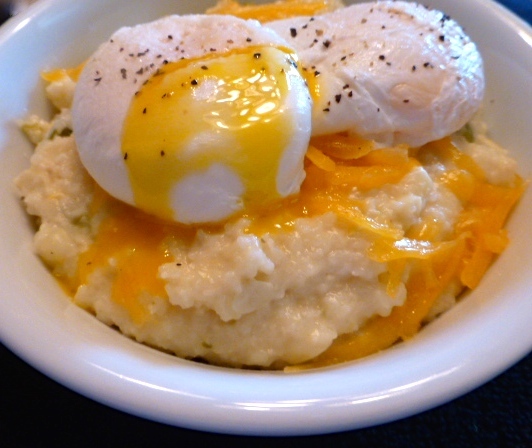 I decided to make a favorite cool weather breakfast in honor of the day: green chile cheese grits with poached eggs. I peeled the roasted chiles and chopped the ones that were not in good enough shape to stuff. I had fresh corn in the fridge that needed to be used. I cut the kernels off the corn and browned them slightly in a dab of butter in the pot I had for my grits. When the corn took on a little color, I added water, brought it to a boil and slowly stirred in the grits. As the grits took up the water and were nearly done, I stirred in the green chile and a little milk to make the grits richer. When the grits were done, I stirred freshly grated cheddar cheese into the pot and melted it into the grits. I then set the grits aside and turned by attention to poaching eggs. Green chile cheese grits with fresh corn and poached eggs. 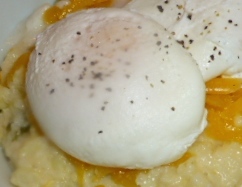 The soft yolk makes the grits mixture silky and rich. A sprinkle of grated cheese adds a little color. While my water heated, I cracked the eggs into custard cups with a couple of tablespoons of distilled white vinegar. I also added a generous splash of vinegar to the cooking water. When water came up to a gentle boil, I started stirring it to create a vortex. I slipped the eggs into the vortex and kept stirring around the perimeter of the pan. The vinegar and the vortex help the white form nicely around the yolk and reduce the stringy egg white that can happen when poaching. I do the eggs individually so they shape up well. I let the white set and I prefer to keep the yolk very runny. The vinegar does not impart a taste to the eggs. I am unabashedly proud of my poached eggs. My technique works about 98% of the time! Why did my okra change color? There is an explanation. I found red okra at the Farmer’s Market. I hadn’t seen it before, so I had to try it. 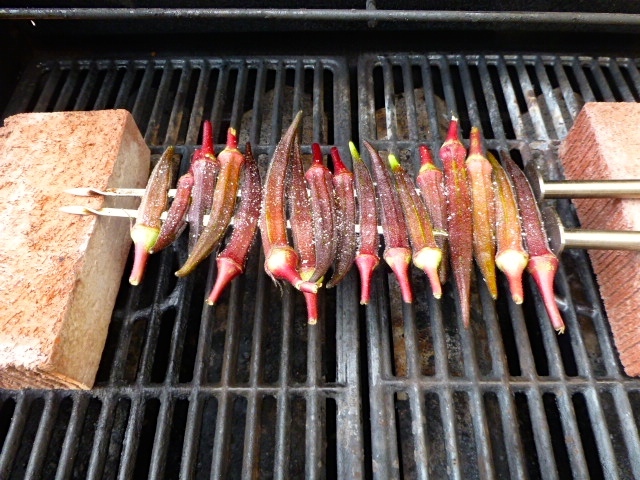 Red okra skewered and ready for the grill. I’ve enjoyed grilling okra this summer. It gives it a firm texture and cooks off the sticky okra juice. I put bricks on the grill to raise the skewers above the grate. No sticking that way. Lightly oiled and salted, the okra gets three minutes a side over the fire. Even before turning, the okra loses its red color and turns green. How can that be? Doesn’t it realize that is messing up my planned photo by shifting color? Color transformation in process. Red goes to green. Friend Darryl Williams wrote in his blog “From the Family Table” about a similar experience with dark purple beans turning green when blanched. He checked a book by Harold McGee and learned that the red and purple colors of most flowers and vegetables are due to a group of about 300 related chemicals known as anthocyanins. They are very sensitive to alkalinity and acidity as well as some metals, which help determine the color the chemicals give a flower or vegetable. They are highly water-soluble, so when they spaces where they are stored break open during cooking,the coloration is rapidly diluted and dissipates. So, that’s why my red okra turned green! Trust a scientist to find the answer. The good news is it still tastes like okra. I pick it up by the stem and enjoy it. 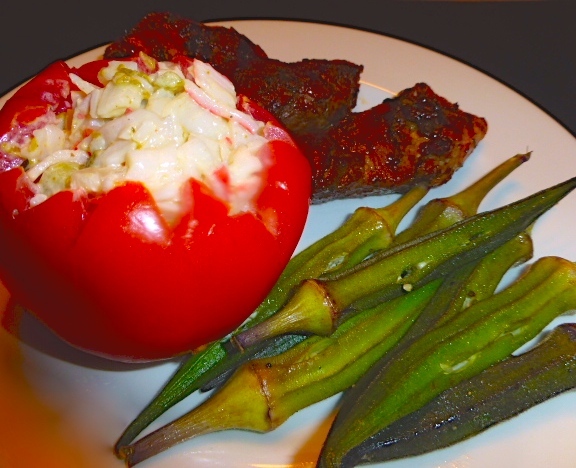 Last night, I served my now green okra with a tomato stuffed with green chile krab salad from the meat counter at the supermarket and some family style boneless pork ribs with a smokey rub and last minute brush of barbecue sauce. The next mystery to be solved is what did I do to get a red tint on the shadows in the photo? Some things are so good you have to share them. Thursday night was a night of things to! The Shootist played at the Plaza Film Festival. Great John Wayne movie! It ended about 9:00 and we set out to find a bite to eat. 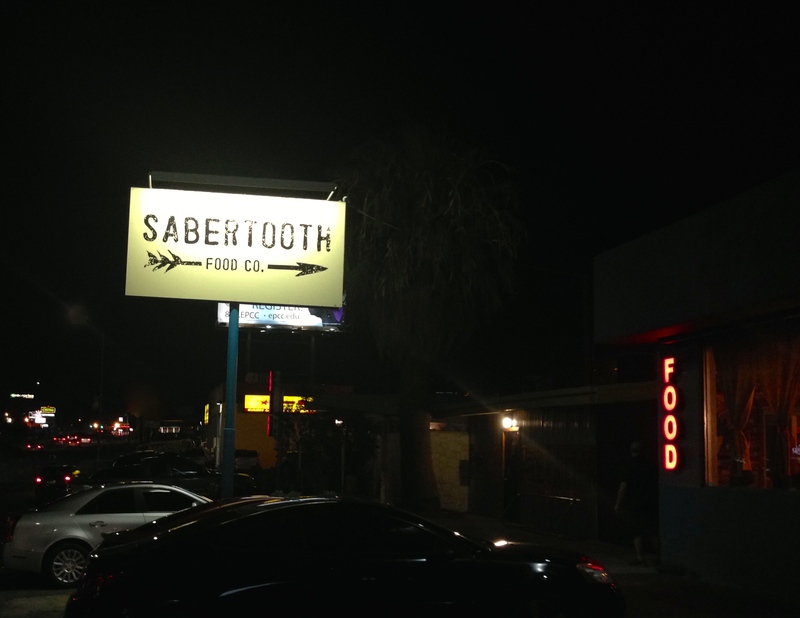 For some time, I’ve been driving down Mesa and seeing the sign for Sabertooh Food Co. a new restaurant in what was a Baskin Robbins Ice Cream store when I was a teenager. I’d been curious about it and it was open. We went in and were WOWED!!! It is a tiny place. Just 24 seats. Its patrons staff are on the young side. They are casually dressed and boast an assortment of hair styles, more than a few tattoos and the occasional piercing. Fortunately, they welcomed a couple of senior citizens. The didn’t card us or throw us out for being too old! 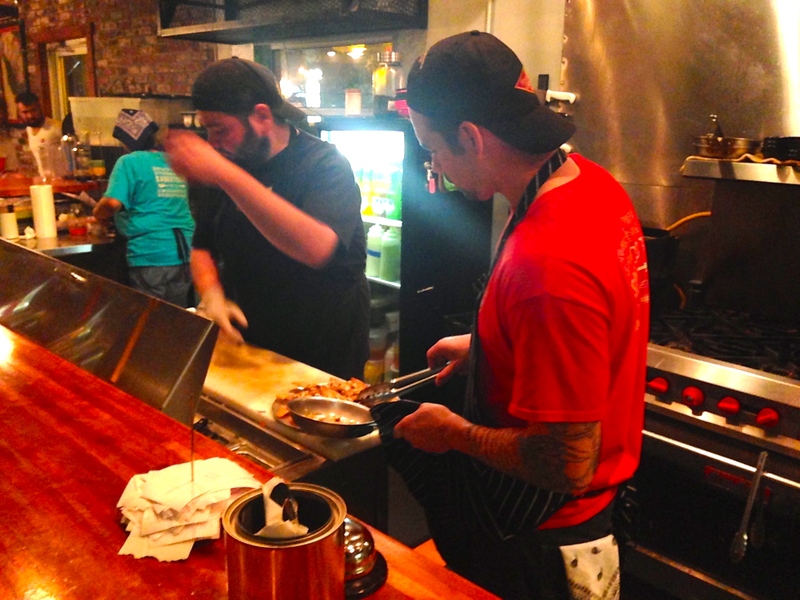 The kitchen is open and you can enjoy watching the chef and crew prepare your meal. I love open kitchens in restaurants and always manage to pick up a few new cooking tips and ideas when I get close to working professionals. The night crew allowed me to take their pictures. I have to confess, I was so intrigued by the atmosphere and the kitchen and the menu as a whole that I didn’t take food pictures Thursday night. I remedied that the next day. The menu is eclectic and enticing. Thursday night I ordered a “Border Treats” appetizer. It was spears of jicama and cucumber served in a tumbler with a chile-lime sauce. Just the right combination of heat and acid to make the jicama and cucumber a great refresher and good way to get the palate ready for main event. I enjoyed a falafel sandwich on pita bread. The generously portioned sandwich included hummus, tzatziki, cabbage and arugula. The vegetables were crisp. The falafel was fried when I ordered. The hummus made we want to order it as an appetizer on another visit. There was a little bite to the tzatziki that was a pleasant surprise. My friend, Jack, had the jalapeño bacon burger. It comes with a side of fresh cut fries that are crisp on the outside, tender on the inside and and lightly seasoned with a house blend of spices. Once you try them, you’ll never order fast food chain fries again! The burger patty was thick and cooked to medium rare perfection. Topped with greens, tomato, sliced avocado and a cilantro lime aioli and served on a toasted buttered bun, it was hamburger bliss. Jack later complained that he ate too much for the hour. I reminded him that no one forced him to eat half the appetizer and everything on his platter except the one fry I was allowed to taste! The diverse menu offers something for savage omnivores like me and items for my savage vegetarian and vegan friends. Please note that I’ve had vegetarian meals both times I’ ve been there just because they sounded so good on the menu! The menu includes a marinated portobello sandwich topped with herbed feta and greens;and a vegan quinoa lettuce wrap of crunchy veggies with a spicy peanut soy dressing appeal the Meatless Monday side. A pulled pork torta with avocado sauce and a mango salsa is on my must try list. I watched one of the line cooks work on marinating skirt steak for the fajita stake sandwich which put that on my list, too. The desert menu includes, but is not limited to, the Sabertooth Elvis – a sandwich of peanut butter, homemade jam and banana dipped in tempura batter and fried. If you want to live dangerously, you can add bacon to the sandwich. And, no, I I have not had the Elvis, yet. I am the Gringo Gourmet with a penchant for all things nopales (prickly pear cactus)… I went back for lunch on Friday just to try the chiles rellenos stuffed with finely diced nopales, and roasted corn in a wonderful cilantro cream sauce. The rellenos were egg battered, deep fried and topped with cotija chese and an avocado drizzle. They are served with a mound of azafron tinted rice. My mouth waters at the memory. Chiles Rellenos from Sabettooth. I will try to replicate them or at least approximate them. They are good enough to make your eyes roll back in your head! 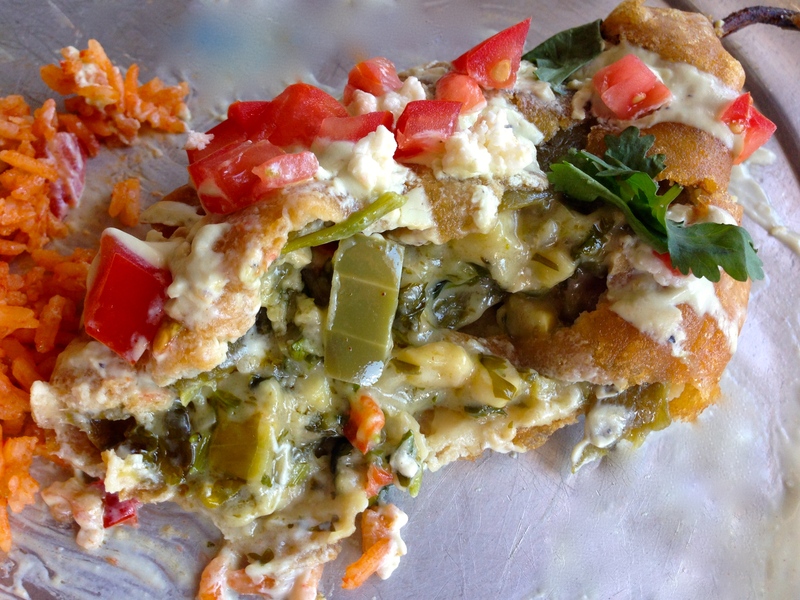 Just had to include a closeup of the relleno filling of nopales and corn in cilantro cream. 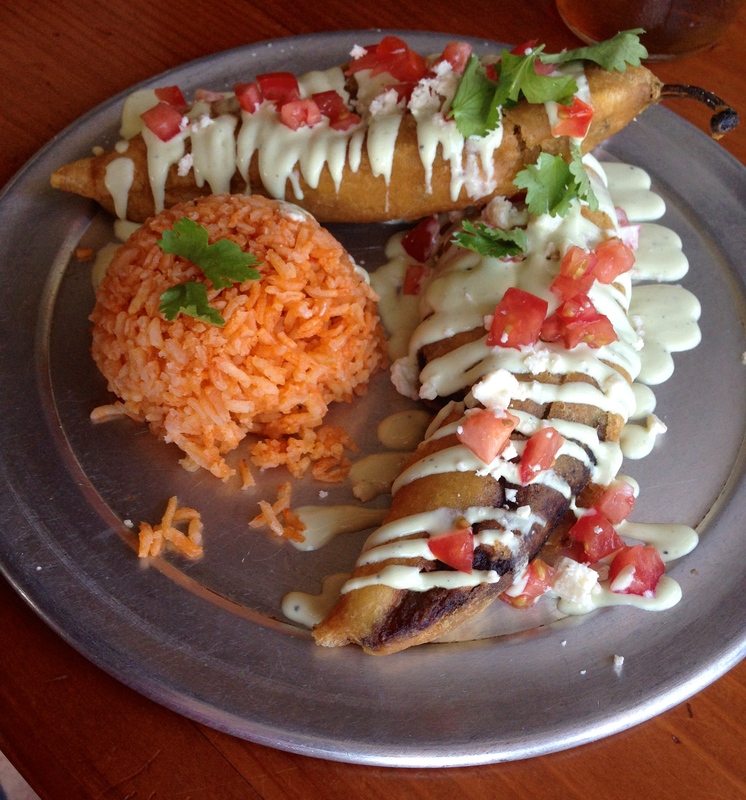 The relleno is topped with crumbled cotija cheese and diced tomato. 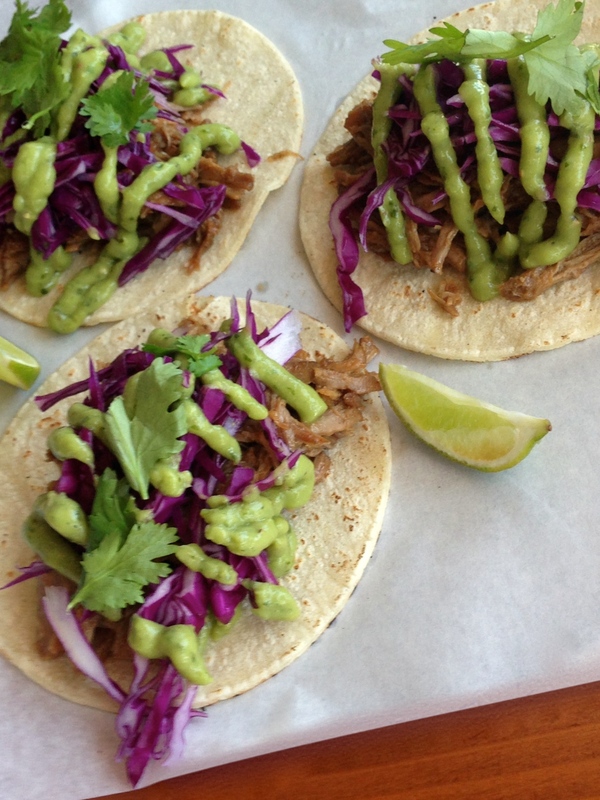 Pulled pork tacos with crisp red cabbage, cilantro and avocado sauce. Jack came along and had the pulled pork tacos. He raved about them with every bite. he restaurant is next door to the Hope and Anchor Bar. That building housed a nursery and flowershop 50 years ago when I was enjoyed the ice cream shop next door. Right now, if you want a drink, you may purchase it at the bar and bring it into the restaurant. The restaurant staff will serve your meal in the bar. Convenient either way. I am enchanted with Sabertooth. Its atmosphere is friendly and fresh compared to many tiny restaurants. The menu is varied and original. It shows that the owner and chef have worked in some of the better restaurants in town and learned many things that helped them to create a great dining experience. They have taken the time to train their cooks well and have taught the waitstaff how to provide efficient, attentive, but not intrusive service. The overall experience would work as well in a softly lighted white tablecloth setting. It is more exciting the way they have chosen to make it colorful and lively as well as delicious. Sabertooth Food Co. is at 4012 N. Mesa, Ste. B. They open at 11:30 a.m. and stay open late – very late on Friday and Saturday. They are closed on Sunday. I hope you’ll give them a try and satisfy your savage hunger as well as I did mine! 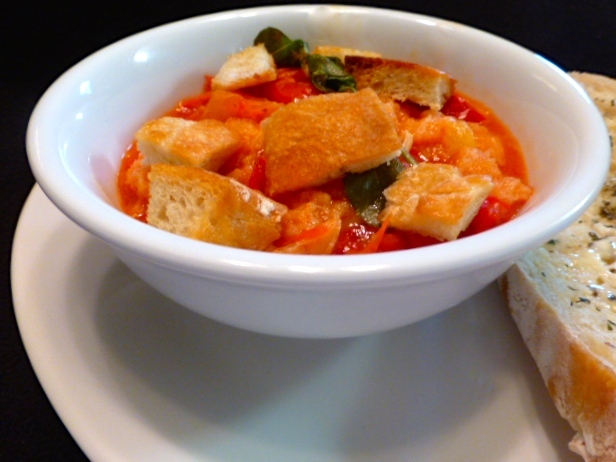 This dish is called Pappa al Pomodoro in Italian. loosely translated that means “mush of tomato.” Whatever it is called, its on the keeper list for me! 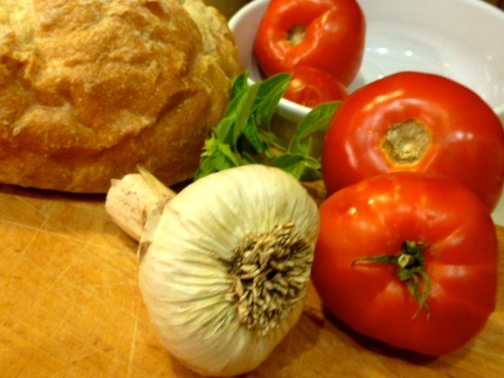 Simple ingredients: a boule of country-style bread, a couple of pounds of tomatoes, garlic, basil and olive oil, make a great thick soup. Core and quarter tomatoes. Save the cores and let them yield their tomato water. Toss the tomatoes, fennel seed and garlic in 3 Tbsp. olive oil in an oven proof dish (I used my Dutch oven). Roast in oven, stirring occasionally, until tomatoes are soft and slightly browned and the juice they yield reduces a bit – 30 – 35 minutes. Transfer tomato mixture to a large sauce pan (or put the Dutch oven on the stove top. Add basil springs and the torn bread. Mush it up in the tomatoes, I add a little tomato water to the pan at this time and let it reduce while the bread gets mushy. The mix will thicken as it cooks. I cube the bread crusts and a little extra bread, toss it with the remaining olive oil and toast it in the oven to make croutons. to serve on the tomatoes. Also, the boule is so, good that I had to make a couple of slices of garlic and herb bread wrapped in foil and heated while the croutons toast. Pappa al Pomodoro and garlic bread. Great supper for a rainy summer evening. Destined to be a summer favorite comfort food, mushed tomatoes are both simple and amazing! Native peoples call squash, beans and corn the three sisters. They enjoy a symbiotic relationship with each plant providing something the others can use. Squash provides a natural mulch at the base of the beans and corn plants helping to moderate desert temperatures and conserve moisture. 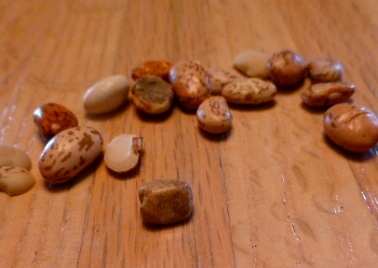 Beans fix nitrogen in the soil to nourish the corn and squash and corn provides a framework for the beans to climb. 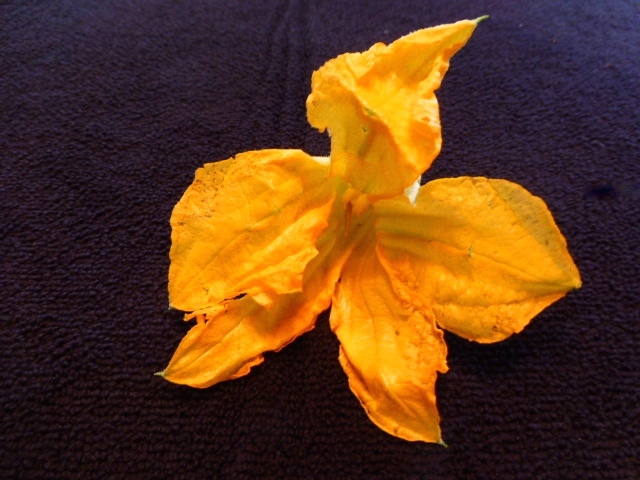 One of the special joys of summer is squash blossoms. They are beautiful to look at and delicious to eat, too! A zucchini blossom is both beautiful and a delicious summer treat. There are both male and female squash blossoms. It is best to pick the males so that the females can produce fruit. When preparing the blossoms, remove the stamen from the center of the flower. The can be stuffed with cheese, battered and fried or they can be chopped and added to other dishes. I didn’t manage to get mine cooked last night, so they were a little droopy this morning. They need to be used as quickly as possible for best results. I removed the stamens and chopped the blossoms and stirred them into a pan of scrambled eggs. Lovely flavor and lovely colors on the plate with a few grape tomatoes and a little jalapeño pepper. A slice of 12-grain toast was just the right accompaniment, but a tortilla would have done as well. 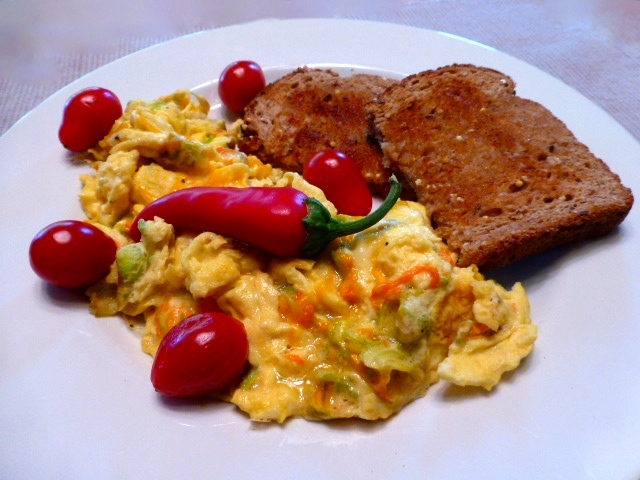 Sunday breakfast, scrambled eggs with chopped squash blossoms, grape tomatoes, multi-grain toast and a little chile kick for fun. Verdolagas or purslane, an edible native that sprouts with the monsoon rains. 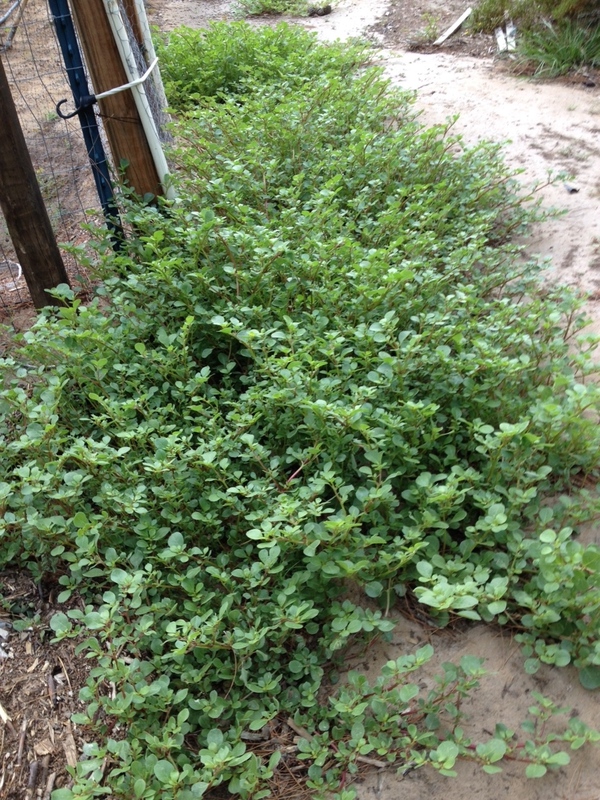 Purslane, or verdolagas in Spanish, sprouts when we get our summer monsoon rains. It is edible. It has a bright peppery taste raw, and is a savory green when cooked. It goes well in a pot of beans. When I use it in native plant cooking demos, I chop it and mix it with a little garlic and onion in scrambled eggs. 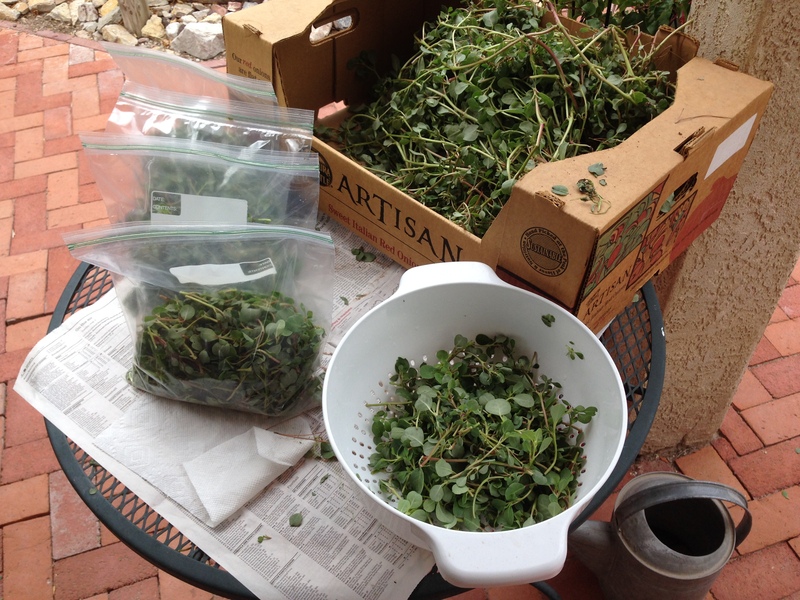 Dave made good n his promise and brought me a box of purslane. A big box! A little more purslane than I had expected! 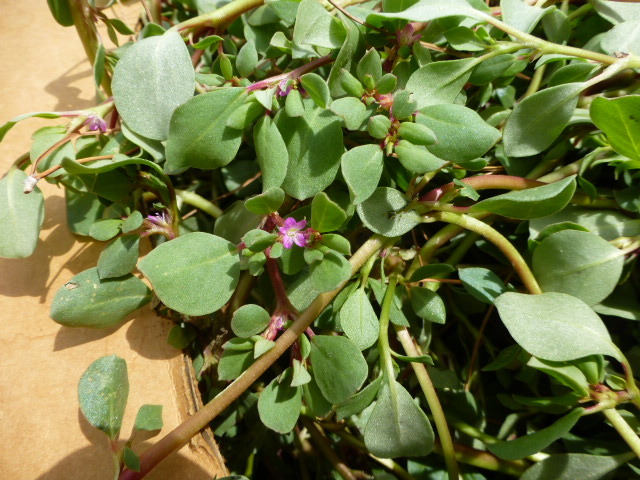 Purslane has flat leaves, reddish stems and tiny purple blossoms. Some folks just wash and chop the plant and freeze or cook it stems and all. I take the leaves and little stems off the bigger ones because they are more tender. It’s more work, but that’s how I like it. After about three hours, I had cleaned and stemmed three pounds for the freezer and a mess for a pot of beans for supper. That was about 1/3 of the box Dave gave me. Lesson learned: The leaves are so filled with water that they disintegrate to mush when they thaw. Don’t bother freezing them. 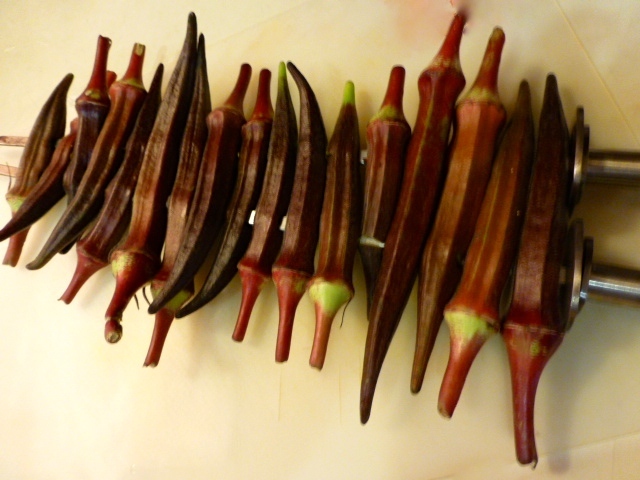 Stemmed, washed and packed verdolagas ready for the freezer. My big colander holds about 12 oz. of prepared greens. My favorite way to enjoy fresh purslane/verdolagas is cooked in a pot of pinto beans, I add them during the last 30 minutes of cooking so they retain a little texture with the beans. 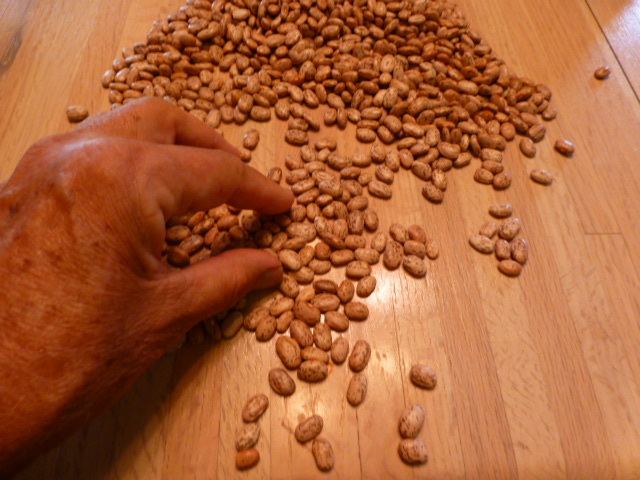 Here’s why we pick through our beans before we cook them. A pebble would be a painful surprise in the pot. Picking beans was the first thing on the list. 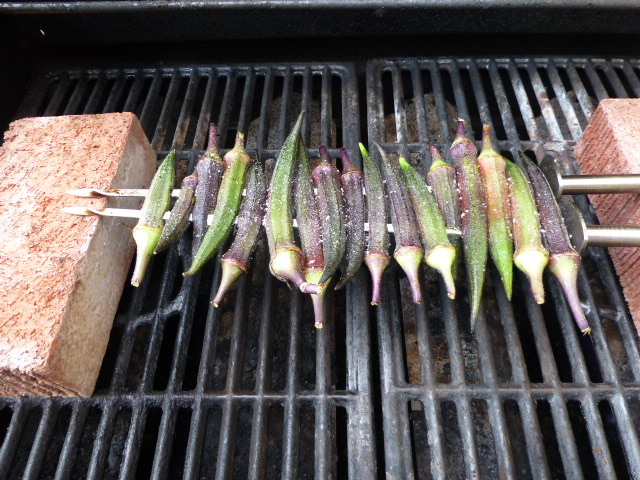 While they cooked, I worked on the verdolagas. It’s good to spend an afternoon working on food and cooking from scratch. We don’t often make time to do that. Few things are as satisfying as enjoying the fruits of our labor. I cooked my beans with some chopped onion, a couple of smashed cloves of garlic and some diced salt pork. We called it sow belly when I was growing up. Of course, the have to be served with corn bread for sopping’ up the juice. A home roasted green chile added a little kick. 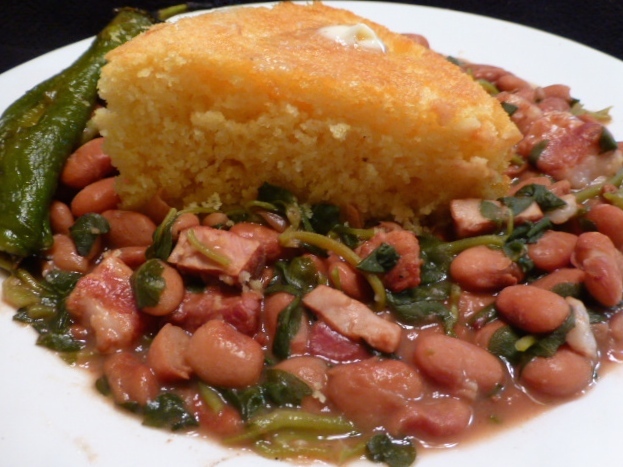 Friday night feast of red beans, verdolagas and buttermilk cornbread down at the doublewide. 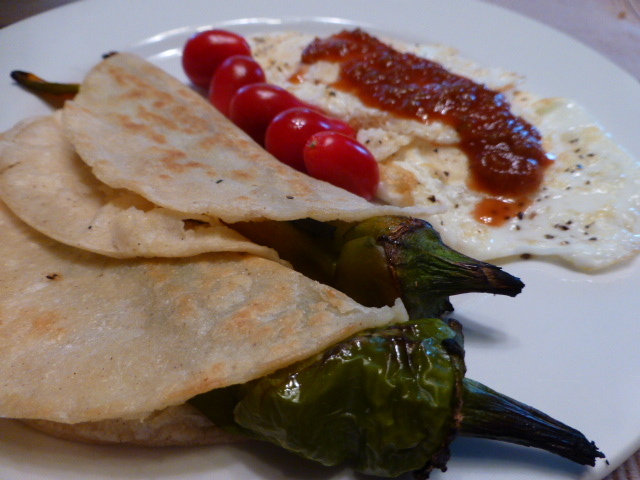 Un Desayuno de Huevos con Chiles Rellenos al Flojero – A breakfast of eggs and stuffed chiles the lazy guy way. Last night, just before I grilled my chicken wings, I roasted some long green chiles from my neice Maria’s garden. She’s spoiling me with fresh produce and I love it! I let the chiles cool and put them in the fridge overnight because I was being lazy after dinner. This morning I peeled the chiles and decided I wanted eggs and chiles rellenos for breakfast. That’s a favorite breakfast here when I have leftover rellenos. I didn’t want to mess with breading and frying just a couple of chiles so I tried stuffing the chiles and putting them in tortillas. I browned the tortillas in the egg pan and melted the cheese stuffing in them. Easy enough and good enough to make again with the chile relleno craving hits! Huevos con Chiles Rellenos al Flojero. – Eggs with stuffed chiles the lazy guy way! Yes, I did remember to remove the stems bore eating. A grape tomato garnish and a little salsa on the eggs rounded out my breakfast. A compliment makes you want to do it again. I ran into a friend and his wife yesterday. She said they had made my no-fry chicken wings and really enjoyed them. That made me feel very good. It also made me want chicken wings for dinner. 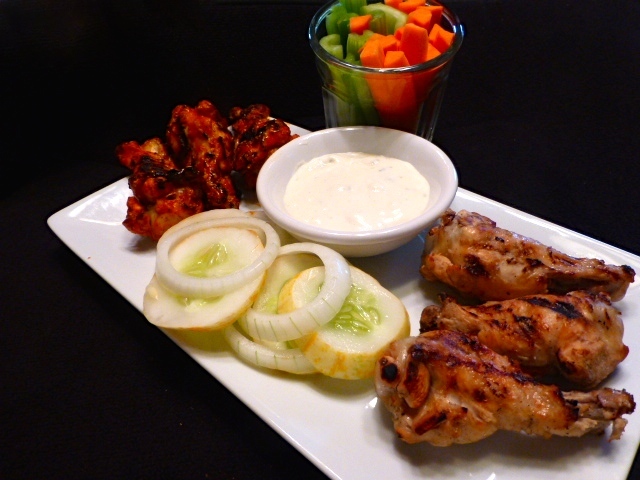 Grilled chicken wings two ways, traditional carrot and celery sticks with bleu cheese dressing and lemon cucumbers and onion marinated in white vinegar. Good eats at the doublewide! I boil my chicken wings for 15 minutes to render the fat and cook the meat. Then I marinate them for at least half an hour, turning them frequently to ensure an even coat of sauce. I like Frank’s Red Hot Sauce and Frank’s Buffalo Hot Sauce for spicy wings. Frank’s is hot enough, but not bitter like some hot sauces. Another favorite is cider vinegar as a marinade. I sprinkle koser salt on the wings when I take them out of the vinegar. I finish the wings on the barbecue grill to give them a little color and get a little crisp texture to the skin. Easy and really good! And no frying mess to clean up! Pearled couscous, because it is a toasted pasta, has a firm texture on the outside and a smoother texture on the inside. It is round and about 3/16 of an inch in diameter. It is made from semolina flour. It is high in fiber and has a low glycemic index. It is on the bland side, but works well with many vegetable and herb combinations. I find it attractive on the plate. 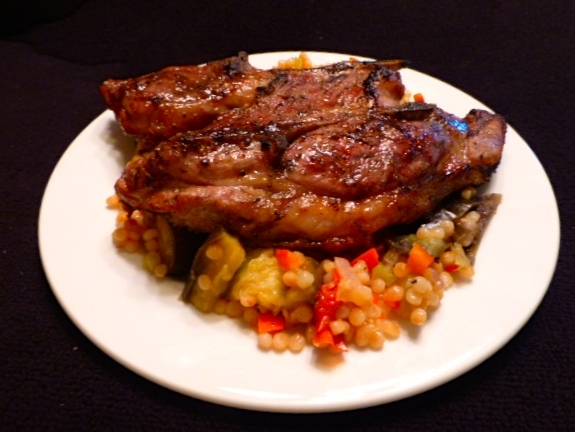 Pearled couscous topped with a grilled lamb shoulder chop has it all, color, texture and flavor! My niece with the great vegetable garden shared some Asian eggplant with me the other evening. That started the ball rolling for a pearled couscous mix. First, I made a brunoise of onion and red and green bell peppers. I halved the eggplant and sliced it into 1/2 inch half moons – then I got to cooking. First I sweated the onions until tender and picking up a little color, then I added the peppers and eggplant and softened them. I added a tablespoon of water at a time to steam and soften the peppers and eggplant. When the eggplant was about half tender, I removed the veggies from the pot, heated it dry, added a little splash of oil, put the couscous in the pot and browned it a bit. The vegetables went back in with the couscous and I added chicken broth and cooked it until the veggies were done and the couscous had absorbed all the liquid. A little salt and pepper brought out all the flavors in the pot. While the couscous and veggies rested, I grilled a couple of lamb shoulder chops. Shoulder chops are usually the best priced cut of lamb. I use a little olive oil, salt, pepper, garlic powder and dried oregano on my chops. Sometimes I rub them with lemon juice and oregano for another layer of flavor. When the chops were done to a nice medium rare, I plated the couscous and topped it with a chop. It tasted as good as it looks.